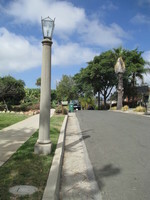 Approximately ten feet tall, the Lincoln Road street lights cinsist of a cast concrete tapered Tuscan column on a square concrete base, with a four-sided metal and glass luminaire. The luminaire has a pyramis top of the same materials, with ornamentation at the corners and peak. Designated City of Santa Barbara Landmark (08/04/1992). 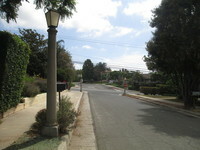 The street lamps are said to be the work of Charles Ericksen, a general contractor from Iowa who came to Santa Barbara in 1912 and lived in a bungalow he built on Lincoln Road. 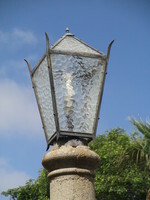 The unique streetlamps are cast concrete tapered Tuscan columns on a square concrete base with a four-sided metal and glass luminaire. A. 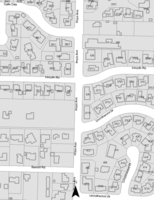 Its character, interest or value as a significant part of the heritage of the City, the State or the Nation. Because the lamp posts are unique to the area and add to the character of the street, and because they were designed by the original builder of several of the houses on Lincoln Rd., the street lamps are significant to the heritage of the City.